The British High Commission has confirmed on its official twitter handle @UKinGhana that Wiyaala will be performing to celebrate Queen Elizabeth's 90th birthday at The British High Commissioners residence in Accra on Thursday 21st April. Jon Benjamin, the British High Commissioner, who is known to be a big fan of the Upper West singer, also added on his twitter handle that Wiyaala will be singing both the Ghanaian and British national anthems as part of her performance with the Djimba World Band. Queen Elizabeth is the world's oldest reigning monarch since being crowned Queen of England and the British Commonwealth in 1952. In 1961, she visited Ghana despite the spate of bombing incidents in Accra protesting the rule of Kwame Nkrumah. The Queen attended many staged events and did original walkabouts whilst meeting organised groups of women, children and people from all walks of life. Queen Elizabeth never expresses her opinion on politics in any public forum, but on religious issues has demonstrated support for inter-faith relations and is on record as saying "To many of us, our beliefs are of fundamental importance. For me the teachings of Christ and my own personal accountability before God provide a framework in which I try to lead my life. I, like so many of you, have drawn great comfort in difficult times from Christ's words and example." 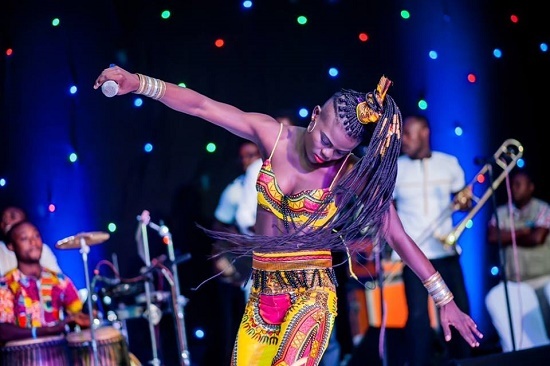 Wiyaala rose to recognition in 2012 when she took first place in the Vodafone Icons reality show alongside her group Black n Peach. Now an established solo act famous for startling live performances and costuming of her own design, she will shortly embark on her first full European tour including a performance at the world famous WOMAD International Arts Festival in the UK.